The new woodland look is bright and whimsical, and these mountain-inspired masterpieces certainly fit the bill. Dramatic color pairings and a hand-drawn, impressionistic approach provide a playful, kid-friendly feel that’s both fresh and fun. Not much of an artist? You don’t need to be! These simple DIYs couldn’t be easier to create. A pencil, a ruler, a roll of painter’s tape and a little patience, and you’re in business. Whether you choose to keep things simple with a single demarcation between earth and sky or create an impressive range of mountainous glory, the basic process is the same. Just section off and paint. Need a little inspiration? Here’s a round-up of our favorite mountain murals, complete with links to step-by-step tutorials. Sit back and enjoy the scenery. This statement-making mural in dramatic shades of black, white and green is actually not as complicated as it looks. See the full photo tutorial, complete with paint colors and a hand-drawn schematic here. 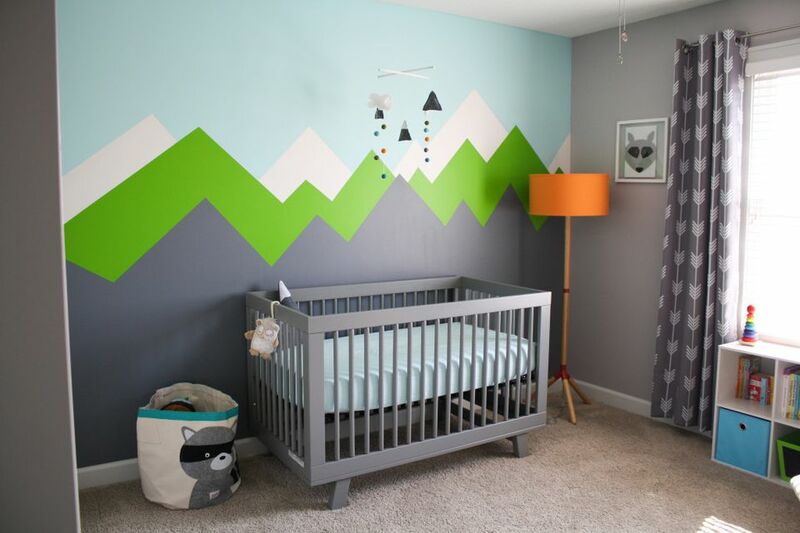 Bold color blocking gives this nursery mural a thoroughly modern look. Bold blue mountains with fuchsia-capped peaks add a touch of whimsy to this elegantly neutral nursery/office space. This imaginative mountain scene in neutral grey and sunny yellow boasts pretty peaks and rolling foothills. A neutral palette of creams and browns creates a soothing effect in this beautifully understated nursery. Paint a simple mountain silhouette with chalkboard paint, and let your little one create their own works of art.